Phineas Fisher, who breached Hacking Team last year, revealed on Reddit Wednesday that he hacked a bank and donated the money to Kurdish anti-capitalists in Rojava autonomous region in northern Syria that borders territory held by the ISIS (Islamic State militant group). 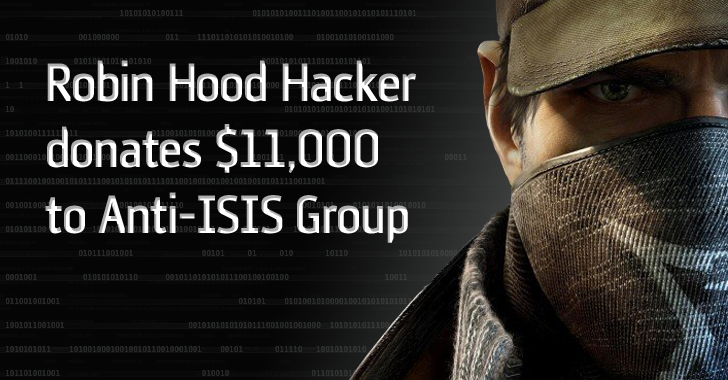 Fisher, also known as "Hack Back" and "@GammaGroupPR," claimed responsibility for both the Hacking Team and Gamma Group data breaches. The vigilant hacker donated 25 Bitcoin (worth around US$11,000) to a crowdfunding campaign known as the Rojan Plan, which has been set up by members of the Rojava’s economic committee, described by Fisher as "one of the most inspiring revolutionary projects in the world." The funds donated to the campaign came from a bank heist, though the hacker neither revealed the name of the bank nor provided any further details of the bank heist. When deeply investigated, it was found that the Rojava Plan's Bitcoin address received a 25 BTC (Bitcoin) transaction timestamped 5th May 2016, which means the donation has publicly been recorded on the blockchain ledger. "You can see the payments made to our campaign on the campaign page. You can also check our Bitcoin address, which is public," Deniz Tarî from Rojava Plan told Ars. The page lists a €10,000 donation by "Hack Back!" Fisher on Reddit even urged another hacker to set up ATM skimming campaigns or rob banks and then donate all the money to the Rojava campaign in order to help the cause.